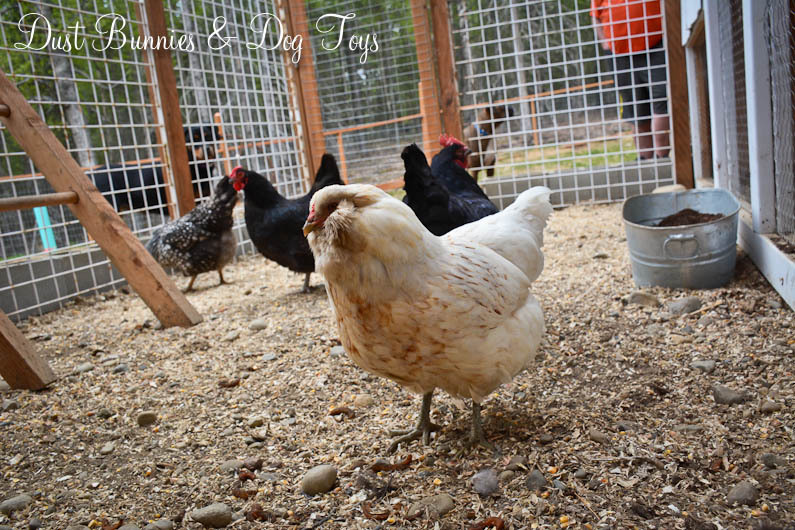 Today I’m sharing a few quick updates I did in the chicken yard recently. Last summer the cluckers kept creating holes along the wood of their run to take their dirt baths. 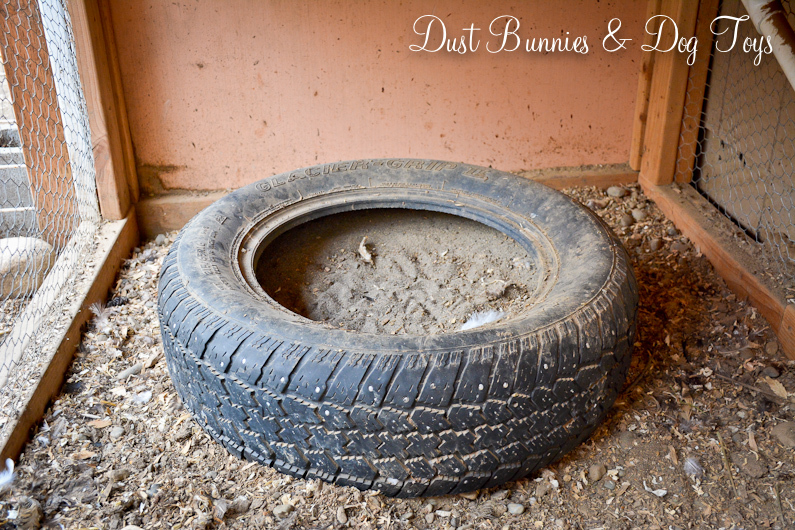 I’d seen the idea of creating a dirt bath spot with a tire and figured we’d give it a shot. I pulled a small tire from the top of the rain garden wall since I plan to revamp that next season anyway and added it underneath their hen house. I filled it with sand so it’s easy for them to flick up on their wings. I haven’t seen anyone using it yet, but it’s obviously gotten traffic based on the foot prints and feathers so I guess it’s a hit. I kind of wish I’d painted the outside of the tire so it looks a little nicer, but perhaps I’ll pull it out when I get to painting the rest of the coop later this season, then refill it. I’ve still got more sand to spread inside the coop run so I can use the sand already in it to get that started. 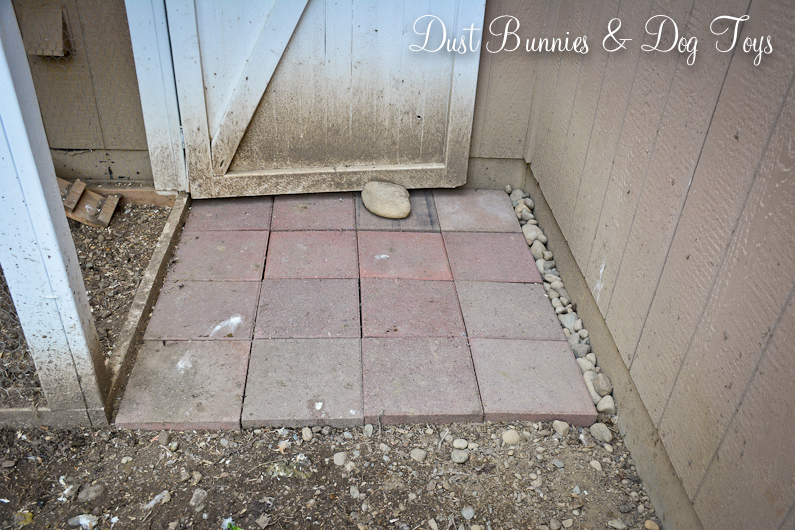 The second project was finishing a small paver area in front of the coop door. This area gets super muddy during the spring due to the run off from the roof and the dirt splashes up onto the door and other wood. I figured pavers would reduce some of that and luckily I had a stack of pavers left over from another project just sitting around. 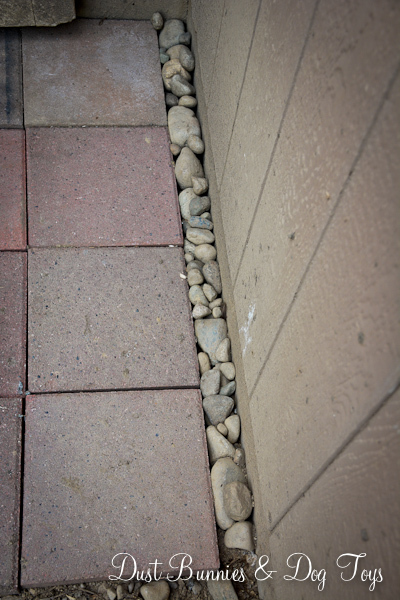 The pavers didn’t fit the space exactly, so I just filled the gap with rocks from around the chicken yard that needed to be gathered anyway. It seems to be working well to provide a bit of drainage when it rains and it’s easy to sweep off or scrape when mud gets tracked across the pavers and gathers. I’ve also tilled the run a couple of times this season trying to improve the drainage but we’ve discovered that the dirt under the coop is mixed with large chunks of wood and rocks from when the builder cleared the lot to build. Eventually we may have to dig the whole area out a couple of feet down and replace it all with a mix of fresh top soil and sand, but that’s a project for another summer. I’ve considered adding growing frames in their yard where I could plant grass under chicken wire for them, but since we shovel the run in the winter I’m thinking they would be more of a hassle than they are worth during the growing season. I have a large metal pallet that I may add to the yard against the wall with small potted plants they could enjoy pecking instead. I imagine I could rotate the pots higher when they need a break from constant pecking to regrow. I may get that project going this season if I find pots and hooks to hold them on sale, but if not we’ll try it next season with seeds I save from this year’s crops.